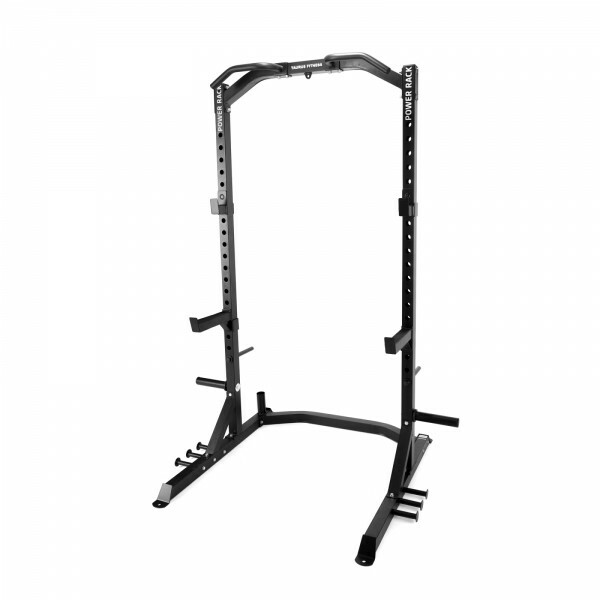 Being available at an affordable price, the Taurus multi-gym Power Rack convinces by an excellent workmanship and its very good equipment. The squat rack is made of sturdy frame and is extremely loadable and stable. The U-shaped frame makes it also possible to use the rack with a weight bench, for instance, for bench press or incline bench press. The equipment includes two long weight racks with a depth of about 20 cm. They can be adjusted in height from 55 to 190 cm. The levels have a space of approximately 7.5 cm. Providing a step-through height of 55 cm, the rack is very good for deadlifts, when you do not want to lift the bar completely from the floor (but from the height of the rack). Additional attachments for 50 mm weight plates are mounted to the frame - so there is order in your strength room. 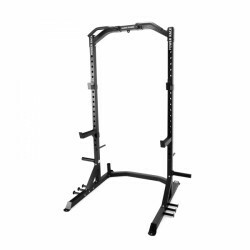 In addition, the Taurus multi-gym Power Rack is equipped with a chin-up bar as well as with a fixation possibility for sling trainers. 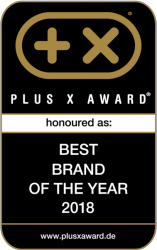 Furthermore, you can use the Taurus multi-gym Power Rack in combination with Power Bands or resistance tubes. Here, extra attachments (holders) are mounted on the frame. Taurus black rubber floor mat In stock!